Canoe Lake Campground opened in 1950’s with rental cottages. Since that time is has been owned and operated by one family. 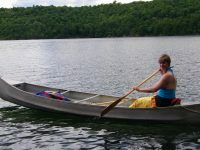 Currently the third generation continues to operate it as a family-friendly, peaceful place to enjoy all that Canoe Lake has to offer. 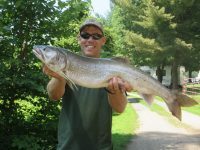 Fishing, boating, kayaking and swimming are a few of the favorite activities. Over the years it has transitioned from weekly/weekend camping to seasonal camping only with full hookup sites. 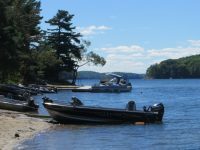 Located 45 minutes north of Kingston and an hour and a half from Ottawa it is a convenient spot for a summer home away from home. 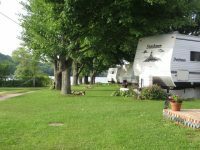 Within a 15-20 minute drive in either direction of Canoe Lake Campground there are small towns with shopping, restaurants, libraries, art galleries, events and golf courses. Westport Ontario, a small tourist town on the historic Rideau Canal, lies to the east and Verona to the west. 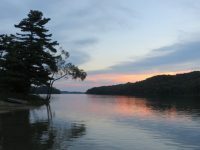 For the outdoor lover there are extensive hiking trails and visitors centers at Foley Mountain Conservation Area near Westport and Frontenac Provincial Park located to the west of the campground. 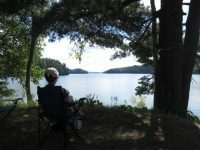 Canoe Lake Campground is a member of the Ontario Private Campground Association (OPCA). Enjoy calm and relaxation on the shores of beautiful Canoe Lake. A deep, clear lake with a natural sandbar. 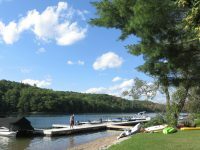 Canoe Lake has excellent fishing, swimming and boating, and there are extensive hiking trails located just west of the campground. 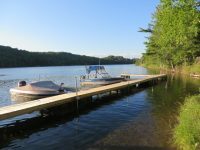 We have a boat launch onsite, docking available, water slide, play area for children with climbing structure & swings, and clean courtesy washrooms & showers. Located 45 minutes from Kingston, or explore the smaller cottage towns just a 15 – 20 minute drive away.